The question of tipping is always a big one for travelers since it can differ so much from country to country. In Italy, the culture around tipping can even vary as you travel up and down the bel paese. To answer your questions and help with travel planning, we’ve gathered everything you need to know about tipping in Italy. The question comes up again and again about the need to tip in restaurants in Italy, because many people say you don’t need to tip at all. It is true that restaurants usually include a coperto, or cover charge, or a separate service charge on your bill. You can check to see it listed when you’re paying if you have a doubt. Restaurant employees are not paid in the same structure as, for instance, in America where their income is highly dependent on tips. That being said, when dining out a tip for good service or an enjoyable meal is always appreciated. We’ve never been out with Italians who didn’t round up a bill when paying in cash to add on a bit of extra for the waitstaff. Usually this is just rounding up to the next €10. If you’re paying with a credit card, leaving a few extra euros for tip as cash is often the best way to go. While it’s a matter of personal preference, we tend to follow the example of Italians and round up a bill to add on a small amount when dining out. Another common question is about tipping for your coffee at the bar in Italy. Unless you’re sitting down (where you’ll pay more than if you order standing at the bar), the usual practice is to pay for your coffee and take your receipt to the bar to order your coffee. You’ll often see Italians placing their receipt on the bar while ordering and leaving small change, usually about 10 cents, with the receipt. While not essential, it’s a nice touch. If you’re sitting at a table and enjoying a coffee or aperitivo, it’s also nice to round up your bill or leave change from the bill. While traveling around Italy, you’ll encounter tipping when it comes to taxis or transfers. Here again tipping is not as customary in Italy. Yet a small tip, or again rounding up the bill to the next Euro, is always nice, especially if the driver has helped with your bags or with travel or neighborhood information. If you’ve booked a longer transfer with a car or minivan, it is customary to tip the driver a bit more. If you’re staying in a hotel, it’s also a nice touch to tip porters for bag service (about €1 per bag) and concierges for travel assistance and information. For housekeeping, about €1 per day is customary. However, we recommend booking a vacation rental in Italy for a unique experience living like a local where a comparable housekeeping tip is reasonable. And when your greeter has been very helpful, maybe €10. It is customary to tip tour guides, especially if you’ve really enjoyed the tour or they went above and beyond to provide a customized experience. The norm is about €5 for a half day tour or €10 for a full day tour per person. Likewise, if you enjoyed a treatment in spa, a small tip is appreciated. 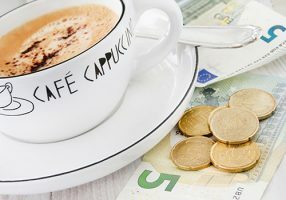 While we know there are a lot of nuances when it comes to tipping in Italy, these guidelines will help you navigate the tipping scene across Italy. Our final thoughts are just to remember that tipping in Italy is not usually essential, but it is greatly appreciated. These suggestions are based on our experience traveling in Italy. When you book with Italy Perfect, we offer helpful information for you to best enjoy your time in Italy. Contact us to book your vacation rental in Italy.